“Up To Now” is a six-minute movie created by artists Carol Es, Jonathan Nesmith, and Susan Holloway as part of the Exodus Project. The above is a slightly lower resolution version of the movie set inside of a 1976 GE television as it was shown inside the original exhibition entitled “Carol Es: Exodus” in the spring of 2015 at Shulamit Nazarian Gallery in Venice, CA. The TV, along with other props and a few vintage lawn chairs, were displayed inside of a large yellow camping tent, as if the artist had been camping in the gallery’s project space. For more images, click here. The six minute movie is the narrated story of Carol Es’ “exodus” into the terrain near the Joshua Tree National Monument. The story is both literal and semi-abstract. It features animated characters against the Joshua Tree landscape in the high desert of Southern, California. The main animated character, “Moppet,” is a long-time autobiographical rag doll person that Carol has used to represent herself in much of her work. 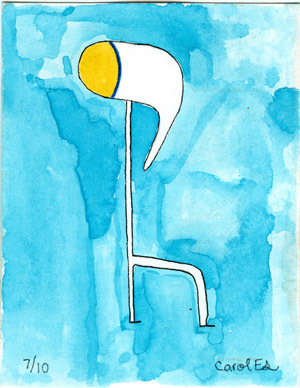 Another character is a giraffe-like thing named “Yuddy,” who has a yud (Hebrew letter) as its head and is meant to represent the artist’s spiritual quest. In Jewish Mysticism, the yud is known as The Infinite Point. This “point” is the spark of G-d’s infinite light to make a place for creation within a single void. Thus the yud has the power to contain the infinite – a kind of ultimate learning experience where Moppet can learn to live with her emotional baggage (or “junk”) by way of studying the Kabbalah. And in the case of this particular story, Moppet, as Carol, finds her childlike desire for adventure, truth and understanding. Right now, you can own a limited edition of the high-resolution version of this movie on a custom flash drive (available at esart.com for $75.) These are the Artist’s Proofs and are limited to 10 copies only. Each of these come with an original watercolor of Yuddy on a 4.5 x 3.25 inch hot pressed, archival illustration board. It fits perfectly inside of the little black case with magnetic closure – from the original Exodus exhibition at Shulamit Gallery from 2015. 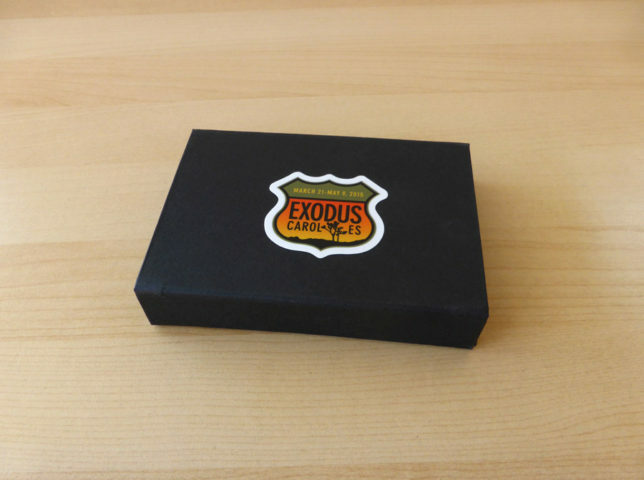 So it has the “Exodus” promotional badge on the cover of the case. There is another NEW edition of the movie that comes with a handmade book called the Spark Edition (not yet completed), which is currently only $150 during pre-sales. For more information on both editions, see the Special Editions page on esart.com.